God has greatly blessed me, not only in saving me and in giving me a wonderful family, but also in gifting me for a lucrative profession which entrusts me with funds for supporting many kinds of gospel ministry for the advancement of God’s Kingdom. I face the ongoing challenge of deciding how to deploy the resources entrusted to me and I am extremely pleased to be a patron of the Co-Mission church planting movement. God has been supremely generous to me in sending his son Jesus Christ to earth to take my sin on himself and thereby enable me to be reconciled to God. There is no generosity to which any of us can aspire which can match God’s generosity. We are merely stewards of the resources that God has entrusted to us to ful l his purposes in this world and not ours to do with as we please. I don’t think for a moment I would be where I am in terms of wealth and success unless God had willed it and if he had willed it nothing I could have done would have frustrated it. Equally if he had not willed it, nothing I could have done would have allowed it. I think the greatest danger of wealth and success is that it can subtly seduce us into elevating our own worth in our own eyes and forgetting that God is ruler of our lives. Wealth can too easily lead us to diminish our view of God and lead us to make idols out of wealth and success, ultimately leading us away from God. I have often found myself succumbing to the temptation to see myself as better than others because of my wealth even if I don’t consciously admit it to myself. Jesus knew what he was saying when he said that “it is easier for a camel to go through the eye of a needle than for someone who is rich to enter the kingdom of God” (Matthew 19:24). By reading God’s word and hearing Bible teachers explain Scripture I have come to understand that our lives in this world are to be lived in light of eternity with God. If this life were all that there is, wealth and success would be what’s most important. But because eternity is real, Jesus is above all things. Once our focus becomes Jesus and honouring him, then wealth and success like everything in this life become about him rather than about us. Life becomes about how I use the wealth and success that I have been granted for his glory. I grasped this intellectually early on in my life as a Christian, but internalising it and walking the talk has been and continues to be a work in progress. I do feel called to prioritise word ministry in my giving and what turns giving into Gospel Partnership is to truly partner with the word ministries that I support with not just my money but with my time, my friendship, my home and indeed every part of myself following the model of the great Gospel Patrons like Priscilla and Aquila, like Humphrey Monmouth (a 16th century English cloth merchant who funded the rst translation of the Bible into English by William Tyndale) and like John Thornton (an 18th century English merchant who supported John Newton). The greatest need of my fellow man is to discover the means by which he can be saved for eternity, which is what word ministry is about. Relieving suffering is not ultimately going to meet man’s greatest need, though I recognise that compassion is also something we need to show to our fellow man in the way Jesus did himself in his earthly ministry. However, I more often than not find it hard to choose mercy ministry when there is a competing word ministry call on my patronage as the potential givers and patrons for word ministry are scarce. I believe God has placed me where I am with the resources and the relationships he has given me to glorify and honour him here and now. I used to think that I was a kind of “sleeper cell for God” and would only need to attend to my ministry calling once I finished with my investment-banking career. But now I realise that I am not in training for something else and that this is where God has called me to serve him and the people among whom he has called me to serve. So I don’t see retiring from my day job to do something else as an option in the near term. I think some good counsel comes from Paul when he commands “those who are rich in this present world not to be arrogant nor to put their hope in wealth” and “to do good, to be rich in good deeds, and to be generous and willing to share. In this way they will lay up treasure for themselves as a firm foundation for the coming age, so that they may take hold of life that is truly life” (1 Timothy 6:17 & 18). to grow a long-term base of prayer and financial support for establishing and planting evangelistic gospel churches across London. 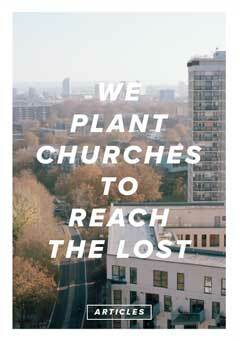 The aim of the Patrons’ Scheme is ‘Partnership in the Gospel’. We see this in the letter from the apostle Paul to the Christians in Philippi: “I thank my God every time I remember you. In all my prayers for all of you, I always pray with joy because of your partnership in the gospel from the first day until now” (Philippians 1:3-5). Our gospel patrons are typically characterised by a sense of joyful sacrificial giving and a committed desire to partner in gospel proclamation to the lost in London. As a result of generous gospel patronage, we have been able to establish new churches in unreached areas across London, and have shared in the joy of individuals receiving new life in Christ.